I’m kind of startled to see that Houston (and San Antonio, Corpus Christi, Brownsville, the entire Valley, etc.) falls into the “Gator Nation” belt. Now, don’t get me wrong; I love alligator as much as the next person. But I definitely wouldn’t categorize it as a Totem food here. And I can’t imagine trying to serve someone alligator in the Valley. Houston’s close enough to Louisiana and the swamps of East Texas for alligator to be fairly standard cuisine, but that’s not true in points west. 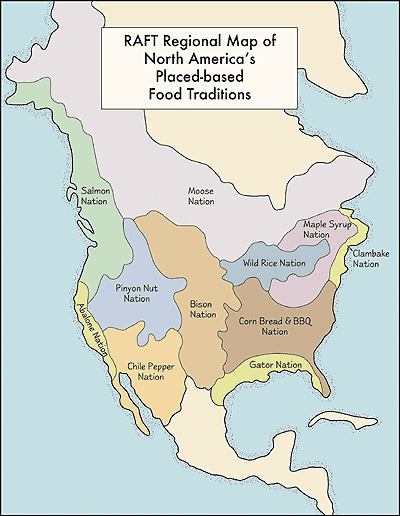 In reality, the whole portion of the Gator belt starting with the Texas-Louisiana border and heading west should be an amalgamation of the Corn Bread & BBQ Nation and the Chile Pepper Nation. Mmm… Now who wouldn’t want to live in that nation?